Of course, as we enjoy the holiday season, we may catch up on our favorite podcasts and be left desperately seeking other alternatives. If you are caught up on Sanctum Secorum, here is a short list of other podcasts to check out. We bet you haven’t caught up on all of them. Spellburn: The ENnie award winning DCC RPG Podcast. The original DCC related podcast, the Judges J (including our own Jen) have built up a library of 60 episodes so far, covering rules, interviewing writers, and creating content. If you are a DCC fan? Check it out. 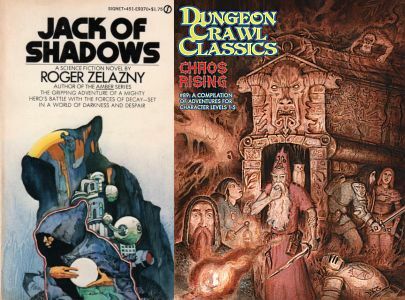 Glowburn: An RPG Podcast that began before its RPG had even been released, Glowburn discusses MCC RPG (Mutant Crawl Classics) and the post apocalyptic fantasy that inspires it. With 11 episodes so far, it is great fun. The Appendix N Podcast: “Judge” Jeff Goad of Spellburn has a non-gaming literary podcast devoted strictly to the works of Appendix N. Where we give some leeway and bend in the content that emerges from the Sanctum, this podcast is strictly Appendix N and is rolling along quite well with 17 episodes to date. The Cromcast: A non-gaming, weird fiction podcast, the hosts of the Cromcast really deep dive into their authors and stories. With more than 100 episodes, the podcast is easy to pick up, and very informative, and fun. It is also the only podcast on this list that comes from wholly outside our known gaming community. Seriously, check it out. Designers & Discourses: “Judge” Jim Wampler, formerly of Spellburn, creator of MCC RPG, released a 6 episode podcast where he sits and talks to some of the big names in the gaming industry: Tim Kask, James Raggi IV, James M. Ward, Harley Stroh, Luke Crane, and Michael Curtis. Each episode is filled with insights and tips. Gaming and BS: Brett and Sean talk about games, often. With a library of 167 episodes, featuring a dizzying number of special guests and in-depth commentary, this is a podcast that should be on everyone’s listening list. Drink, Spin, Run: Billed as the RPG Talkshow Podcast, this 65 episode show certainly isn’t Carson or Letterman. Episodes tend to be in two parts, the first focusing on, exactly what the label says, what folks are drinking, listening too, and playing. The second part of episodes discuss fairly focused topics ranging from investigative RPGs, to specific products. So there are seven shows. You may have listened to many or most of them, but we aren’t so sure that you’ll be caught up to date on all of them.